ACRLog welcomes a guest post from Megan Donnelly, Adjunct Research Librarian at the Millersville University of Pennsylvania. I am an Adjunct Research Librarian at the Millersville University of Pennsylvania’s Francine G. McNairy Library and Learning Forum, where I have worked for the past year. My role is public services focused. I teach information literacy instruction, conduct outreach and provide research assistance. Scholarship, service and scholarly growth are also explicit requirements of my job, clearly stated responsibilities in my job description, because librarians are tenure-track faculty at my institution. Librarians here have the ability to gain tenure, like professors in the academic disciplines do. As an adjunct faculty member, I do not have the ability to gain tenure because my position is temporary. However, I am still required to engage in scholarship, service and scholarly growth but without the parameters and end goal of tenure. At my institution, activities that fall under the category for scholarship are researching, publishing, presenting and continuing education. Service encompasses service to the library and the university. This takes the form of service to committees, boards and community organizations. Scholarly growth is fulfilled by staying up to date in the profession via professional development and service to outside professional organizations. I understand that criteria and activities for tenure can differ at each institution. A large learning curve for me as a first year academic librarian was how librarians are classified in the academy and how scholarship, service and scholarly growth apply to these classifications. In my last quarter of graduate school I started applying for professional positions. I observed phrases in faculty librarian job postings such as, “Record of professional scholarship and service,” “Evidence of a professional record,” and “Willingness to stay up-to-date and improve skills.” I had an idea of what these criteria meant but it wasn’t until I was hired as adjunct faculty at my institution that I understood the role they play in the tenure and promotion process, the many benefits they offer, and the implications they have on my personal life. As an entry level academic librarian, without prior professional academic experience, my first stab at scholarship has proven to be both a complicated and valuable learning experience. Although scholarship is a requirement of my job, I am given a very small annual professional development fund. This implies that I need to apply for grants to fund my professional development such as faculty grants and grants from outside organizations. This past Fall 2018 semester, I gave my first presentation at the Florida ACRL Annual 2018 Conference, in Fort Myers, Florida. This required a flight from PA to Florida, putting me well over my small annual professional development fund. Thus, I was introduced to the grant application process. Faculty grants at my institution are internal grants from the university used to support research, publications, travel to present, special academic activities, and released time. Attempting to secure funding this way was difficult to grapple with at first, on top of the stress of my first presentation, but it grew to be an incredibly beneficial experience. I can now say that I know how to apply for a grant and I can list the grants I have been awarded on my CV to aid me in securing a permanent position in the future. My institution also has a flat hierarchy, so this also gave me opportunities to communicate with my colleagues to ask for advice. I learned quite a bit from each of them, not only about the procedure for faculty grant application at our institution, but also about their experiences with grants at their previous institutions. Communicating with my colleagues to learn more about scholarship was critical to my success, and collaborating with two of my colleagues on my first presentation really helped me learn the ropes. I fulfill the service requirement of my position primarily by serving on library, as well as university wide, committees. My position is designed to give entry-level librarians professional experience so they are able to secure a permanent position in the future. It is also designed to allow entry-level librarians to make informed decisions regarding which areas and types of positions in the field they would like to pursue. I have the opportunity to choose which library committees I would like to serve on to gain experience, and am a member of: the Teaching and Learning Committee, Information Literacy Assessment Committee, Communication and Connection Team, Digital Assets Committee, Collection Development Committee, and the Research Fellows Committee. I am also a member of the university wide Open Education Resources Working Group and the Made in Millersville Conference Planning Committee. Service has taught me what it means to collaborate with others at a professional level, what I consider to be the single most valuable skill for academic librarians. It has also taught me how to communicate effectively. Service provides an outline of the work that I do so I am able to organize my skill set into comprehensive categories and better communicate my capabilities to future employers. I strongly recommend that first year academic librarians consider participating in service opportunities. Scholarly growth has proven to be the most inspiring of the three requirements I have discussed in this post. I fulfill my responsibilities to scholarly growth by serving on the board of ACRL Delaware Valley Chapter as blog editor, as well as attending conferences, programs, workshops, webinars and internal professional development opportunities. These experiences have provided me with access to innovative practices in librarianship that I can use to grow as a professional and contribute to the advancement of my library and institution. They have also provided me with essential networking skills and opportunities. Serving on the board of ACRL DVC has really opened this door for me. Since my position is temporary, networking in this way has given me access to news of vacancies at my colleagues’ institutions as soon as they are posted, if not before. It has opened my eyes to what types of positions I will feel most fulfilled serving in, as well as what these positions may look like at other institutions. Scholarship, service and scholarly growth have taken their toll on my personal life. Sometimes preparation for a presentation, collaborating to publish with a colleague and board member responsibilities bleed into my personal time. As a twenty-something millennial, it’s difficult to see my friends in entry level positions excel in their careers without the pressure of these responsibilities. I am still learning how to balance these activities in addition to my other responsibilities at work and my personal goals. This has materialized through trial and error, but also from the knowledge I have gained from communicating with my colleagues and scholarly growth activities. This webinar, for example, was a great launching point for thinking of work/life balance within the context of scholarship, service and scholarly growth. The presenters also speak to how these activities fit into the tenure process. It helped me significantly as a first year academic librarian. Thinking to the future, I often wonder what scholarship and service will look like in my life once I secure a permanent, tenure-track position. I think about what implications they will have on marriage, family planning, personal finances and how I relate to friends and family outside of academia. What was/is your experience with scholarship, service and scholarly as a first year academic librarian? ACRLog welcomes a guest post from Adrianna Martinez, Reference and Instruction Librarian at New York Institute of Technology. In the Fall of 2018, I started my first full time librarian position. I work at New York Institute of Technology in Long Island, and I hold the position of reference and instruction librarian. As a queer latinx woman of color, I was (and am still) thrilled to work with such a diverse group of students. The students here are a mix of locals and international students. They come from different economic backgrounds, ethnicity, religious affiliations, and primary languages. I wanted to introduce myself to the NYIT community with instruction and programming that made my approach to academic librarianship clear: to elevate and support underrepresented voices with approachable and critical pedagogy. I want to make the academic library a space that reflects and holds resources for the NYIT community as intellectual individuals, not just their program. Key to this work is constantly reassessing my language and actions by a) greeting people at the reference desk with gender neutral language b) starting every interaction with my pronouns, and asking for others to do the same c) starting literacy instruction and workshops with a traditional territory acknowledgement. These practices may seem small but make a great impact on inclusion for the entire community– they have resulted in positive feedback from students as well as an increased interest in research help. Yet, I felt that there was a more visible way to reach those students that have not attended an instruction session by me or stepped foot in the library, which made me think, how can I try to reach those students? One answer was creating space for different kinds of students to feel comfortable in, even if that space is only temporarily highlighted as specifically for them. One group I wanted to advocate for inclusion in the library was queer folks. The LGBTQIA+ representation on campus was hard to find. For resources, events, even the club itself I found only a sprinkling of information. There was no queer resources page, no official website or office, only an email address to contact. A campus for higher education without visible queer representation can be dangerous, not only for those on the LGBTQIA+ spectrum, but all marginalized people on campus. In making one group seen, it opens the door for others to both see themselves reflected in their institutions and be active about wanting to be represented. The academic library can and should be a center for diverse support and inclusion to better serve its community, as well as motivate the rest of the institution to make change. In order to be a voice for marginalized folks on campus, I inquired about the PRIDE student group and administrative diversity initiatives. I already had an idea for an event that would draw attention to the unique experience of queer folks and wanted to include the community. Student Life and some members of the PRIDE group relayed to me the reason for such an absence in queer life at NYIT. Safety was the main concern for these students. Some members were not out yet, and others had been harassed on campus, therefore they felt that it was safer to have a closed group. This method did, however, isolate those students not included in the closed group. With this knowledge, it was clear that the first event held by an entity that is not traditionally involved in outreach about inclusion. I needed to create an environment that was approachable for students concerned about outing, invite queer folks outside the group into a space of representation, as well as the general public to encourage allyship. National Coming Out Day occurs every year in the United States on October 11. It was the perfect opportunity to host an event that created the environment the students appeared to be craving. Coming Out is an activity that can symbolize many modes of being. It exists for queer folks of all kinds and those that exist in the margins; talking about it recognizes those people that experience it without isolating them. For this day, I wanted to create a space on campus that was specifically queer for the entirety of the day. Creating a temporary queer space in the library for this occasion extends beyond the duration of the event in that space. It shows that the library is a safe space for that community year round as well. The event was located behind a counter created in a pseudo-cafe area near vending machines and a microwave. The space was surrounded by small tables and couches, the most casual space in the library (an important note for not only accessibility but also for comfort and noise level). With such little public representation, an all-day event allowed for students to study in a queer centered environment on camps, something that does not happen often. A full day event that did not require myself to maintain needed to be visual and had to do with storytelling. Free to use tools, and accessible material were essential in the medium choice for this event. As a medium for storytelling, YouTube functioned perfectly. Projected from a mondopad the videos could play all day without issue. People all over the world share their perspectives and experiences on YouTube. The dialogue about National Coming Out Day had to have individual experiences and perspectives at it’s center. To make this event as inclusive as possible, it needed to reflect culturally diverse experiences, from every part of the LGBTQIA+ spectrum. With this criteria in mind, I created a playlist of stories from the queer community from the material available on YouTube. The playlist was not only composed of queer material but also varying perspectives from allies. Another element to the playlist was videos from the It Gets Better Project. In 15 minutes of sitting in the cafe drinking coffee one could encounter a video of four tips for coming out to your parents by the parent of a queer child, a video of individuals coming out to their immigrant parents, and a clip from the first National Coming Out Day celebrated on the Oprah Winfrey Show. In another 15 they could encounter a video explaining the concept of two spirit, a Buzzfeed video of individuals talking about how they felt before and after coming out, as well as someone talking about the similarities in coming out in the queer community and coming out in the disabled community. The mix of experiences and moments of high impact in American culture to do with the LGBTQIA+ community that a student may be discovering for the first time created an environment of curiosity for everyone involved. My role after the playlist was set up for presentation was to invite people into discussion about coming out. To maintain a casual tone of the event, I made coffee for anyone that stopped by. If a student just wanted coffee, while the coffee brewed, I told students what the event was about, and if they knew what National Coming Out Day was celebrating. I would highlight information about the current video playing and allowed the student/s to direct the conversation. Some students discussed in brief their own coming out story, or asked questions which I answered on an individual level, and one even came out to me and we discussed in depth family dynamics and whether he would feel comfortable coming out to them, or if he wanted to stay in the closet until he felt more independent. This kind of event has never been hosted by NYIT before, to build community in this way, especially not by a librarian, which makes this event significant not only for the queer community but for all marginalized groups. In entering the event space on October 11 students were exposing themselves to voices that had not been elevated on campus before. Whether they were getting an extra caffeine jolt, or working while quietly listening or even just heard about the event; this made an impact. It showed that the library space is for the entire NYIT community, and we as librarians are conscious that representation matters. I felt the real impact after the event ended. The event sparked a trust among the queer students and myself. Some students would find me in the library to share with me their experiences on campus as queer folks. The planning and follow through of this event allowed me to have a platform show my support for the community even when they didn’t ask for it. In doing so, it built a trust between myself and the closed PRIDE group that benefits the entire NYIT community. I am now working with the PRIDE group to become their adviser. As a member of the queer community, I am personally invested in supporting the NYIT LGBTQIA+ folks during my time here. However, one does not need to be a part of a marginalized group in order to support them in a forward facing way. This kind of event does not require a lot of materials or space. Especially in a reference and instruction there are simple steps that one can take in order to make students feel visible. Solidarity and representation is happening on many fronts of librarianship: from the reimagining of knowledge organization systems, to archival work, but there is more to be done, especially on the fronts of outreach and instruction at the academic level. The process of inquiring about an underrepresented group can be an act of advocacy. Communities change through allyship and conversation. An academic library can exist as many things, including a center for reflection and self growth, not just scholarly thought. If underrepresented populations are not placed into these spaces, it is a disservice to the community. This is just one example of a way that outreach at an academic level can exist that strengthens the queer community. In the upcoming months I will be bolstering the library’s collection in order to fill in the intellectual gaps here, as well as creating a library guide about LGBTQIA+ resources through the library and beyond. This is only the beginning of my time at NYIT, but it is not the beginning of this train of thought. On a commuter campus like NYIT it is hard to make an impact that leaves an impression of what someone can get out of the library; adding queer solidarity and acceptance to that list may motivate more students to seek them out. ACRLog welcomes a guest post from Julia Feerrar, Head of Digital Literacy Initiatives at Virginia Tech. During the summer of 2016 my library began to envision a more coordinated effort around supporting digital literacy on our campus. We began by examining the scope of digital literacy at Virginia Tech and have since developed a framework to help us build towards a shared definition and language for our context. For me this process has been a really interesting chance to reflect on the relationship between information and digital literacy (as well as media, data, and many other literacies), and to explore perceptions and needs around these literacies on my campus. Building towards consensus around a nebulous, multifaceted concept like digital literacy can be very challenging, but we’ve been able to have some exciting conversations and build connections across campus as we move towards shared understanding. As Alexander et al. illustrate in the NMC Horizon Project Strategic Brief on Digital Literacy in Higher Education, Part II, definitions and frameworks for digital literacy vary, particularly in their emphasis on technical skills, critical thinking and creative abilities, and social or cultural competencies. Considering that these pieces can shift in different contexts, I think that it was important for us to begin with the what and why of digital literacy, before jumping into the how of digital literacy on our campus. An initial task force within the University Libraries began the work of navigating existing definitions for digital literacy and identifying needs in our context. The task force was particularly influenced by Jisc’s Digital Capability Framework, which positions digital literacy as “capabilities which fit someone for living, learning and working in a digital society.” We discussed these capabilities as including engagement with a variety of digital tools, types of content, creation processes, and decision-making. The ACRL Framework for Information Literacy in Higher Education and its emphasis on students as “consumers and creators of information who can participate successfully in collaborative spaces” was also foundational to our thinking. It was important to us to think about digital literacy as flexible enough to include common or foundational skills related to critical consumption, creation, and collaboration, and to support learners in achieving their own goals for their digital lives. Following the Libraries’ task force, we drafted a framework graphic and sought feedback across the Virginia Tech community. We reached faculty and graduate students through existing professional development opportunities as well as by hosting a day-long digital literacy symposium, which also served as an opportunity to build community among those who support digital literacy at Virginia Tech. During these feedback conversations, we asked participants about any elements they saw as missing from the framework draft as well as where they saw their work connecting to it. With all of this feedback in mind, we revised the framework to a final (for now) version. 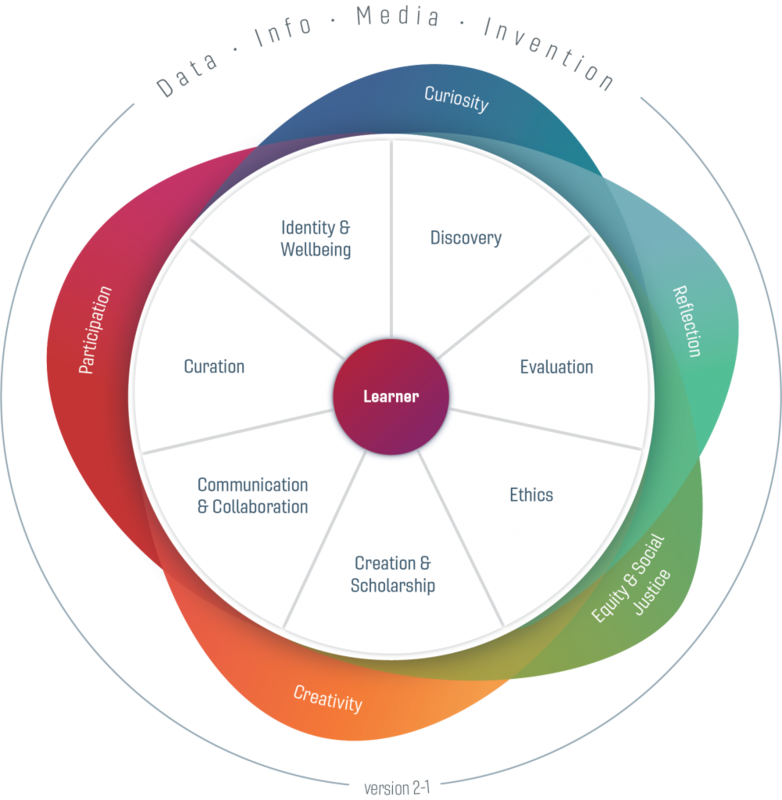 This framework represents four aspects or layers for digital literacy at Virginia Tech. The learner at the center, who might engage with the other areas in the framework in any combination or order. Key values that connect and contextualize the competencies. I see these as as particularly tied to the why of digital literacy and our hopes for our learners as engaged digital citizens. Multiple literacies that frame the outside of our framework. I think of the literacies as our lens or lenses on digital literacy. Our framework approaches digital literacy as a kind of umbrella or metaliteracy that includes information, data, media, and invention literacies. While a particular class session, workshop, or online learning module might focus on one of these in particular, they come together to inform the way we think about digital literacy as a whole. While I find this to be a useful way to think about the relationship between these several overlapping literacies, I want to acknowledge that it is certainly not the only way. As Jennifer Jarson points out in her 2015 post, many of us might conceptualize information literacy as the broader category that includes digital literacy. I think it’s possible to take any number of literacies into the foreground as a lens for others and I find that my own thinking shifts depending on the context. As individuals we might gravitate towards one literacy or another, perhaps depending on disciplinary background, but ultimately I think that looking at them in conjunction can help us to think more expansively about our hopes for our learners. Looking forward, our framework will guide the continued development of digital literacy initiatives. Within VT Libraries, I see this framework as helping us with two major activities: more strategically coordinating and sequencing our existing library educational offerings around digital literacy (course-embedded instruction, co-curricular workshops and events, new spaces and technology for creation) and identifying areas for further development. More broadly, my hope is that our framework will also help us to continue to build shared language and shared vision for digital literacy learning as we continue to build partnerships in support of student learning. ACRLog welcomes a guest post from Mandy Babirad, Instructional Services Librarian at SUNY Morrisville State College, Heather Shimon, Science and Engineering Librarian at the University of Wisconsin Madison, and Lydia Willoughby, Reference Librarian, Research and Education, at SUNY New Paltz. Mandy Babirad (now at SUNY Morrisville), Heather Shimon (now at UW-Madison), and Lydia Willoughby (SUNY New Paltz) created an instructional game called Ghosts in the Library (Ghosts) to use in English Composition I library sessions (Comp I) at SUNY New Paltz in Fall 2015. The game aligns with established Comp I learning outcomes and includes self-directed learning, problem solving, collaborative learning, and peer review. In the game, students work in groups and use the library catalog and databases to research a notable person with ties to New York State (a “ghost” who is haunting the library), and then create a digital artifact based on that research to appease the ghost. The “ghosts” are people of color and women who have made significant contributions to New York State, yet are underrepresented in the historical record. With the library’s namesake of Sojourner Truth, and student protests against a predominantly white curriculum occuring in Fall 2015, the game was also an attempt to include marginalized voices within the library collection and course syllabi. The primary goal for Ghosts was to frame a 75 minute one shot library instruction session with a pedagogy of possibility. Roger Simon, in work that drew from deep collaboration with Henry Giroux, thought about student-centered learning as a choice of hope, and teaching as an act of hope. “Hope is the acknowledgement of more openness in a situation than the situation easily reveals… the hopeful person acts.” (3) Being open to possibilities is the only mindful and clear choice for teaching librarians facing technology distraction and student disinterest in a required library session. Bringing in curiosity as play engages inquiry as an affective process that asks student and teacher to act and reveal a more whole self in the classroom. The game has one central goal: to appease your team’s ghost so that the ghost will leave the library and our campus alone. Each team gets a ghost card, team members choose role cards, the team members then use the tool cards to hunt down information that will help them appease their ghosts, and the final and culminating component of the game is the team creation of a historical marker. All game materials can be downloaded from the Ghosts research guide: newpaltz.libguides.com/ghosts/scholarship. Worksheet for the game to be completed in class time (the worksheet contains the rubric that teams use to evaluate their work and the success of their historical marker at appeasing their ghost). A Packet of Cards (each packet contains 1 ghost card, 3 role cards and a 3 tool cards. Ghost cards are randomly given to each group and are all women and people of color from New York State history that have a tie to the Hudson Valley region. The 3 role cards include a historian, a presenter and a facilitator. If the composition of the class that you are teaching needs the group to be divided into more than 3 people per group, you can double up on historian role cards. All role cards contribute to information gathering and drafting the text of the historical marker. The historian takes notes on the worksheet and enters the team’s text on the historical marker that the team is working together to create. The presenter is the person that presents the team’s historical marker to the class. The facilitator keeps the team on track and ensures that all tool cards have been used in information gathering, and that the team’s work fulfills all the roles of the rubric. 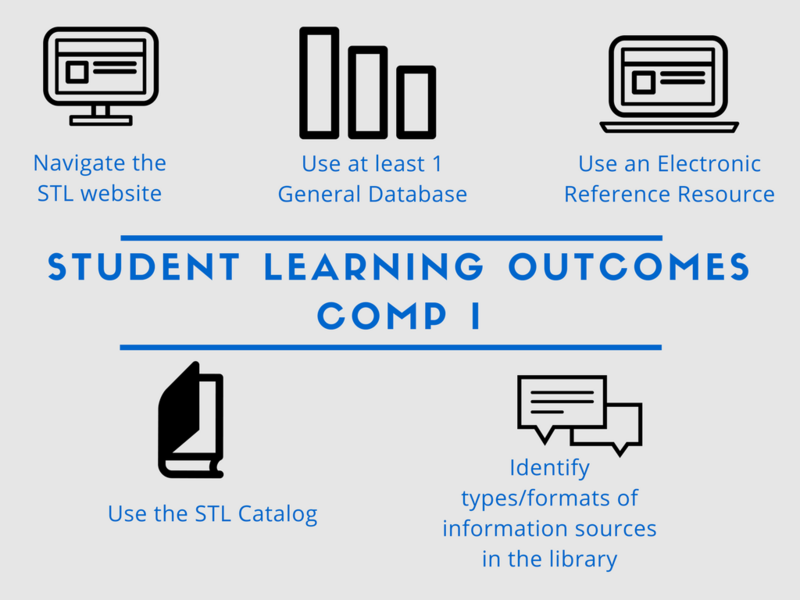 The 3 tool cards correspond to the library research tools students use on the library website to conduct research. A tool card for reference resources helps students to find background and biographical information on their ghost using Gale Virtual Reference Library. The final part of the worksheet is a space where they can draft the text of their historical marker, a synthesis of their respective roles and tools in the research process. Once teams have completed the worksheet, they go to our custom historical marker website, https://apps.library.newpaltz.edu/plaque/index/plaque, to enter their text. Once they publish their historical marker and hit “Create,” their original text will appear on a digital artifact that looks like a ‘real’ NY State Education Department 1940. The artifact creation component of this game is designed to encourage student learning with a pedagogy that helps students connect to something ‘real’ and physical in the research process. Students present the historical markers, and all game players receive a ghost button and a FAQ zine about the library. Summary discussion concludes the session focused on what kinds of information the students gleaned from which kinds of library resources. We found that student input on the worksheet question, “Why did you choose this?,” to be the most valuable question to assess student learning. Even though only 52% of students reported that they would definitely use the resources from Ghosts again (and 42% reported ‘kind of’), their worksheets suggested otherwise. The student worksheets demonstrated skill in describing the research process in detail, showing an ability to evaluate information sources and needs. Even so, only 35% of student reported that the game had value to their course assignments, and 48% said that the game was ‘kind of’ valuable to their course work. There is a disconnect between the students ability to reflect on their own research and their view of the usefulness of those skills. Meaning, that as with all library instruction, the value of learning systemic thinking struggles to be visible and relevant to course assignments when structured in required sessions. The students were describing their research process, but not equating that task with the value of learning how to research. Interestingly, 71% of students definitely felt included while playing the game, and 31% ‘kind of’ felt included. In the future, more evaluative questions will be posed in both the worksheet completed during the game and the post-assessment. The final product, the historical marker, won’t have a word count. Editing the marker down to 50 words took up a lot of time and stressed some of the students out which in turn may have influenced their evaluation of the game. The game could be tightened up and the worksheets could be transferred to online forms, so that the game is more of an online tutorial, which would facilitate flipped learning and provide the opportunity to use class time to have a more discussion based session informed by the work that was done outside of class. An idea for a follow-up assignment include writing a letter or postcard to your ghost describing how you research their history and what kind of things you found to encourage students to again practice being descriptive of their process. It is hard to get students to reflect on process; it is not practiced and it is rarely evaluated or asked for in their graded assignments. The code for the historical marker would not have been possible without the work of software developer Andrew Vehlies. He created the marker from scratch in consultation with the librarians and posted the code on Github (available here) so that other history enthusiasts can benefit from his work. Once the code was developed and posted publicly, library technician (and human grumpy cat) Gary Oliver was able to post to local servers so that it could be used by students. Many thanks to instruction coordinator Anne Deutsch, at SUNY New Paltz, for letting us pilot Ghosts in the first place, and for supporting the game development in the library instruction program. Simon, R.I. (1992). Teaching against the grain: Texts for pedagogy of possibility. Greenwood Publishing Group.